February 9, 2014 0 comments on "Choosing the Best Wine for Valentines Day"
Choosing the best wine for valentine’s day is not an easy task. 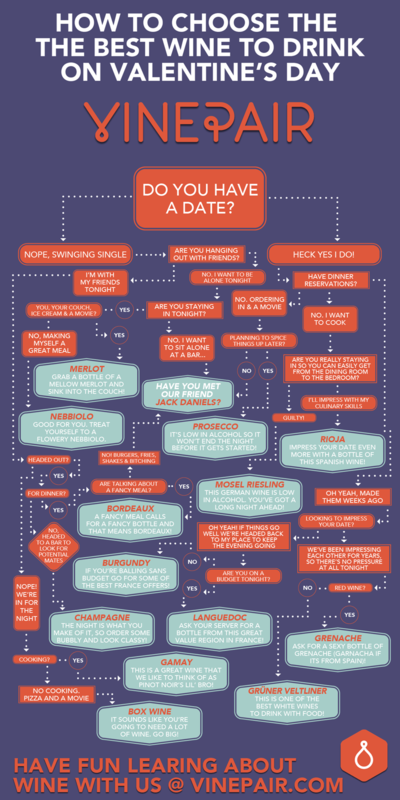 The following infographic by Vine Pair details out in a visual form how to choose the best wine to drink on valentines day.Whether one is single or in a relationship, it does not matter. There are some of us that have limited taste in wine, and consume it subject to the occasion. In this case, the occasion is Valentines Day. However, 14th February does not necessarily guarantee a date, and what should single people attempt to do on valentines day? If its wine, how should single people think versus others?